Comments: Because of their strong social bonds, predatory lifestyle, and loud high pitched howls, northern grasshopper mice have been compared to large carnivores like wolves. They mark their territories with a strong scent and vigorously attack intruders. They have a short tail, robust body, and soft, silky fur. They feed at night and spend most of the day in underground burrows. From spring to early fall they produce 2-3 litters of 2-6 young and live up to 3 years in the wild. 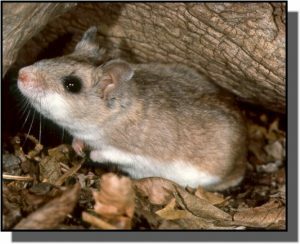 Distribution: Northern grasshopper mice are found in arid and semiarid regions ranging from Mexico through central and western United States and into Canada. They are most often found in dry, sandy grasslands and shrublands of the western two-thirds of Kansas. Food: Northern grasshopper mice are the most carnivorous of mice species. Eighty percent of their diet consists of grasshoppers and other insects, 10 percent rodents, and the remaining 10 percent includes seeds and other plant materials.